The Pittsburg Pirates finished in second place, 4.5 games behind the Brooklyn Superbas, in the 1900 National League season (the only Major League in American baseball at the time). Fans of the Pittsburg club felt their club was every bit the equal of the Brooklyn nine. While Brooklyn led the league in offense, Pirates fans claimed their team, which led the NL in strikeouts and ERA, boasted the pitching to best Brooklyn. 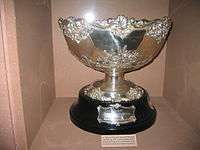 A local newspaper, the Pittsburgh Chronicle Telegraph, offered to award a silver cup to the winner of a best-of-five series between the two teams. However, Pittsburg committed 14 errors to Brooklyn's 4, letting the Superbas win by comfortable margins. Three unearned runs in the top of the sixth inning of Game 2 allowed the Superbas to break a 1–1 tie, and Pirates pitcher Sam Leever's crucial fourth-inning error in Game 4 broke the game open for Brooklyn. A 10–0 blowout behind Deacon Phillippe's six-hitter in Game 3 gave the Pirates their only win in the series. The Pirates won the next three National League pennants and to play in the inaugural World Series in 1903. The Brooklyn baseball club did not win another postseason series until 1955, their first World Series championship. Two future Hall of Famers faced off as NL ERA leader Rube Waddell of the Pirates threw against Joe McGinnity, who led the league with 28 wins. McGinnity shut out the Pirates for eight innings before two unearned runs in the top of the ninth denied him the shutout. Waddell gave up 13 hits but only five runs, despite four errors by his fielders. Fielding flubs continued to stymie the Pirates in the second game as they held Brooklyn only one earned run, but allowed three unearned in the top of the sixth thanks to a series-high six errors in the field. Brooklyn hurler Frank Kitson held Pittsburg to four hits. Deacon Phillippe pitched a six-hit shutout for Pittsburg in Game 3. Pittsburg avoided the sweep by battering Harry Howell for 13 hits — all singles — and 10 runs. It was Brooklyn's turn to hurt themselves, as seven of the 10 runs were unearned. Deacon Phillippe threw a six-hit shutout. Joe McGinnity was shaky in the final game, allowing nine hits, but the Brooklyn defense returned to form (they had the second-fewest errors in the league) as it allowed only one run to score. McGinnity did not allow an earned run in his two complete game wins during the series. Three Brooklyn singles coupled with a fielding error by Pittsburg hurler Sam Leever in the fourth inning gave the Superbas a comfortable 4–0 cushion which they would not relinquish. World Series#1892–1900: "The Monopoly Years"